Ask fellow campers about "Deer Creek Valley RV Park" and nearby attractions. Quiet, clean, gated park. Pool not open but looks very nice. Very long sites. Would return. We camped at Deer Creek Valley RV Park in a Travel Trailer. We visited the state capitol. Lots to see there and free tours. Learn the history of Kansas. Definitely worth a visit! Very clean park. All pull thru sites. Gated after hours and at night. Employees are super friendly. Allowed to get mail and packages here which is super for full time RVers. Only issue is our water faucet leaked and when I reported it, they already knew about it but haven’t got it fixed yet. $15 to wash R.V. We camped at Deer Creek Valley RV Park in a Motorhome. Eat at Lonnie’s BBQ just outside gate. Lonnie owns both R.V. Park and restaurant. Best BBQ we have ever had. Thanks, glad you liked the park. Unfortunately, when you arrived the weather had just decided to get above freezing, so some of our water issues hadn't been corrected yet. As you noted, however, we did have it on our list of necessary maintenance to get to as soon as possible. We hope you will come back soon and thanks for visiting us! I stayed here for two months. Monthly rate is cheaper than nightly. Owners are great and friendly. Grounds are well cared for with big sites. We camped at Deer Creek Valley RV Park in a Fifth Wheel. Thanks, it was great to have you. Hope you can come back again soon! Nice concrete pads, snow had been nicely plowed, good WiFi and cable and they allowed me a late checkout due to windshield repair on my checkout day..nice people running the park..always a bonus!! Park was pretty empty during winter. We camped at Deer Creek Valley RV Park in a Motorhome. Easy access off 70...didn't do much exploring due to cold, snowy weather! Hope your windshield keeps it's head down! Thanks for coming in, we look forward to you returning soon! Very nice place. All pull thru sites. Good idea to reserve in advance as it was full both times we were here. Small pool we didn't use because of rain. Follow their water connection instructions or you could get a wet foot because of the diverter valve. We camped at Deer Creek Valley RV Park in a Fifth Wheel. Just off the Interstate so you have easy access to anywhere in Topeka. Glad you enjoyed your stay with us. We are a busy place, that's for sure! The water diverter can be a problem if you're not careful, it happens to us too! Maybe the next time you stay with us the weather will cooperate better and you can use our pool! Thanks for coming in, we look forward to you returning! Interior roads and campsites are concrete. FHUs all worked fine. Lots of pull throughs. WiFi was good. Some campers are long term but their sites are well kept and not overflowing with stuff. Campground is gated and locked at night. We camped at Deer Creek Valley RV Park in a Fifth Wheel. Be sure to grab a meal at Lonnie's BBQ right outside the gate. Evel Knievel Museum was interesting and the tour of the Capitol Dome was awesome. Great RV park. Good electric, water and cable. All concrete pads, and picnic tables. No trees to worry with when pulling into or out of the lot. All lots are well marked, and signs for easy reference for first timers. Nice pool and nice dog park. And a security gate which was great. Would stay here again, 10 stars...... Monthly rate is the best rate. And power is 16 cents a KWH. So if you like the AC like we do and its hot in Kansas... $$$ We camped at Deer Creek Valley RV Park in a Fifth Wheel. My perspective is that of a traveler with a 40' motorhome and toad. 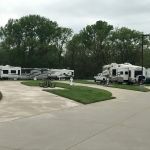 Wow, I rarely give a ten rating but this RV Park (not campground) is one of the best designed and maintained parks that I've ever experienced and I've been in all lower 48 states. 59 sites and every one is an angled pull-thru. All the roads are poured concrete and all sites re poured concrete. Even the grass is edged along the roads and sites. The utilities are all on a manufactured lighted outlet post. Wonderful large dog park, pool, bathhouse, office and much more. The entire park is fenced and gated. 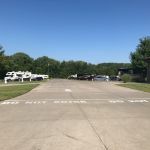 Although it is very close to I-70, traffic noise could not be heard due to forested vegetation around the facility. The only negative comments that there is no shade and more importantly, there is very rigid (and in my opinion unnecessary) speed bumps. I would recommend and stay here again. We camped at Deer Creek Valley RV Park in a Motorhome. One of the best RV Parks. Many conveniences in the Topeka area. Nicely kept park with restricted access, all sites pull-through on concrete pads, well maintained grass, large sites, however, there is no shade. Park is also next to major interstate and traffic noise can be significant. Shopping, gas, restaurants are 2-3 miles away. We camped at Deer Creek Valley RV Park in a Motorhome. Very nice RV park that was convenient to downtown Topeka. All sites are paved and fairly level. Our site was not perfectly level, but we saw very few trailers using levelers other than us. Sites are fairly close together, but have a paved picnic area and all are extremely long. Wifi was good. Bathrooms were clean and well air-conditioned! Bathrooms also were very spacious which is nice since they double as the weather shelter. We camped at Deer Creek Valley RV Park in a Travel Trailer. Be sure to stop at the BBQ place right outside the gate for the RV park. It's the #2 restaurant on TripAdvisor and was amazing! Portions are HUGE so go with a big appetite or be prepared for leftovers. They are only open for lunch M-F and a brief dinner on Friday, closed on the weekends. Not sure why the hours are so limited, but go if you can! Park is extremely clean and well set up. Wide smooth level streets. Easy to get into each campsite. All sites are pull-thru and have wide level cement pads with roomy plush grass area for each site. No trees so excellent satellite access. Great service. Written hookup connection instructions. Good Sprint and ATT reception. We highly recommend this park. We are full-time travelers and wish there were more parks like this. 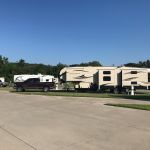 We camped at Deer Creek Valley RV Park in a Motorhome. About 1 mile off of I-70, easy on / off. Wonderful place with all pull through sites on level concrete. Nice area between each site with nice grass, in fact the landscaping is very good. No large trees in the actual park. Great dog park and nice play area with pool. Wide roads which made it easy to pull in and center in our spot. If arriving after the office closes call for gate code. Did not try their internet but all hook ups worked fine. We camped at Deer Creek Valley RV Park in a Motorhome. This RV park is one of the cleanest, nicest parks I have ever stayed at. Great service, friendly staff and LOTS of space between sites. Concrete roads and parking pads, grassy areas that are well tended, well lit at night and quiet. There was also a small restaurant/bar in walking distance from the campground. I have two wishes for this campground: wish there were a bit more shade as it was very sunny and hot and the shade would have been nice and wish they had a small section in the store for sundries/groceries. Other than that, it was one of the best campgrounds we've stayed in. Just too bad it's in Kansas who's weather is awful (storms, heavy winds of up to 80 MPH and golf ball size hail). If I ever come through Kansas again (doubtful), I would make it a point to stay here. I would recommend this campground to all RVers. 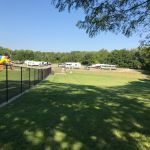 We camped at Deer Creek Valley RV Park in a Travel Trailer. I stayed here for a month. Very friendly and helpful staff. Security fence and gate. Excellent location! Good playground. Just okay pet area, but large. Good pool, with an awning for shade, but water was cloudy. Chairs, loungers, and pool toys were provided. Very, very clean grounds. They had a nice office but no clubhouse (games, TV, books, etc.). Lots of concrete but not one tree in the whole park made this a very hot place. Some trees would have helped by providing some shade. No sand in horseshoe pits. Lots of year-round residents, but everyone I met was very friendly. I would return here again but not without complaining about the lack of ANY shade trees. We camped at Deer Creek Valley RV Park in a Travel Trailer. Everything is immaculate at Deer Creek Valley. The concrete pads and patios are beautiful. Grass is well maintained. We especially loved using the spacious dog play area. Would definitely return when in the area. We camped at Deer Creek Valley RV Park in a Travel Trailer. We loved the Evel Knievel museum. We also visited the Capital building and the military air museum. If you have guts, do the Capitol tour to the dome. Hike around Lake Shawnee, ~7-8 miles. If that is too far, at least, check out the gardens. Nice hiking trails @ Dornwood park (close to RV park) and @ Governor's Mansion (NW side of town). Nicer hiking trails @ Perry State Park, ~20 minutes. The public library is amazing. Get all the details about Brown v Board of Education historical site (for free). I especially liked the civil rights timeline that runs throughout the exhibit. You gotta stop at Lonnie's BBQ just outside the park. Limited hours M-F 11am to 1pm plus dinner Friday night. Ribs are available only Thursday and Friday....trust me they are outstanding. About and hour from the campground is the National Tallgrass Prairie Preserve in Strong, KS. It is a very nice area with walking trails and Bison Herd. Near there is a town called Council Grove which was settled in 1825 on the Santa Fe Trail. Council Grove was where the cattle drives would stop over on the way to KS railheads. It was also used by many settlers to meet and form wagon trains. We were visiting the National Park Brown vs. Board of Education. The BBQ place next to the entrance is one of the BEST ever! Tip for the folks that are long. Carnahan off I 70 becomes narrow two lane with no safety lane when going south to 21 St. Also 21 St. is a narrow two lane with no safety lane when you approach the park entrance. Be mindful of your turns or bad things could happen. WalMart is less than 2 miles away. Visit the State Capitol only 4 miles away. Kansas politicians went into debt for $327MM renovating their state capitol and it's pretty opulent. Visit Lawrence to see University of Kansas. Drive to Independence, MO and Harry Truman's home and Presidential Library is 74 miles and well worth it. Shawnee Lake Park is very nice for walking/biking/fishing. We missed Lenny's BBbQ, 11-1, and 5-8 Fruday night...supposed to be great, we arrived too late , right outside the gate! Everyone talked about Lennie's BBQ. You can only get ribs on Thurs and Fri. We had the pork sandwich...and it was OK. The owner is only open 12 hours a week. He works 60 hours preparing the food and has over a 1,000 customers come through each week. The capitol building went through a $300 million rennovation...and it shows. A must see! Eat at Lonnie's BBQ and go to the Ted Ensley Gardens a mile or so away. Close to restaurants, shopping, and all Topeka has to offer. Dillon's grocery is an easy 15 minute drive. Best BBQ in Topeka is right next door. Easy access to highway. If you're hungry, Lonnie's BBQ is within walking distance of the park. Awesome food, and all but their bread and potatoes are gluten-free! Fabulous BBQ restaurant (Lonnie's) is right on their driveway. Sparkling clean and open from 11-1, Mon. thru Fri. and 5:30-7:30 Friday night. Closed weekends. It's the best we've ever had, and we have eaten BBQ in all the top spots. Only a few minutes from the Capitol and State Museum, both of which are very good. State capitol city. Historical sites. Gorgeous lake Shawnee with walking trails and arboretum. And golf, beach with water park. A visit to the State Capital is worthwhile. Be aware that tours, including a walk up to the dome, is only available Monday through Friday. Just outside the campground entrance is a great BBQ/baby back rib restaurant, but they are only open during the weekday lunch period and Friday evening. We had the baby back ribs and they were some of the best ribs we've ever had. Visit the State Capitol and take a tour (free) - well worth it and also a climb up the 297 steps to the top of the dome to take in the views. Also visit the 1st Presbyterian Church opposite the Capitol to see the stunning Tiffany windows. Tour the capitol building, including the dome tour. The Combat Museum and the Kansas National Guard Museum are close together, by the airport. Eat at Lonnie's BBQ right next door. It is THE BEST. No kidding. Lonnie's BBQ is within a 5 min walk from our site. Excellent food. Check out the state capital, climb the 296 steps in the dome! Great view! Topeka has too many sights & places to see to list any specific ones, although just outside the park is a BBQ restaurant with lunch hours only which used to be at another location ... Haven't tried it yet, but all say it is delicious and worth the line. 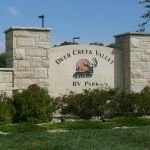 Are you affiliated with Deer Creek Valley RV Park ?